I am simply challenging you to make your understanding of IT IS FINISHED bigger than it is right now. Peter said in 2 Peter 3:18 grow (increase) in grace and knowledge (the intimate first hand knowledge) of our Lord and Savior Jesus Christ! 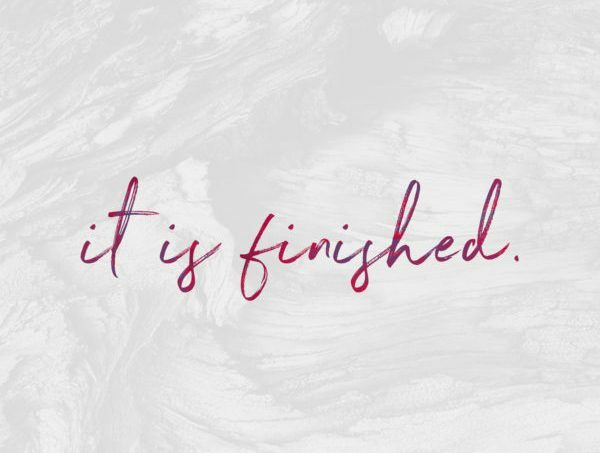 Last week we talked about the fact that IT IS FINISHED or tetelestai in Greek was a loud battle cry to lay your weapons down and go home because the war was over… the enemy had been COMPLETELY defeated… it was a FINAL and FULL victory! Warfare only takes place between two undefeated foes. Once an enemy has been CONQUERED, the war is OVER! Our Father said similar words in Genesis IT IS GOOD! He prepared it this way… whole – lacking nothing… nothing missing, nothing broken for his son Adam to simply receive. Which produces either condemnation or self-righteousness in our thinking. Our life is not lived on a battlefied… even if you spiritualize that with the fact that it’s fought from the position of seated in heavenly places. Our life is VICTORY! The battle has already been won! Instead of being demon/devil conscious and warfare conscious, we need to be FINISHED conscious! Victory conscious! Defense against evil “spirits” was a big concern in ancient Mesopotamia. To them a “demon” was an evil god. They believed that sickness came from demonic possession and demons carried the name of the specific sickness they bring i.e. “headache,” “fever,” etc. Israelites also believed that demons lived in deserts or ruins, inflicted sickness upon people, troubled men’s minds, and deceived them. The only difference between their beliefs and pagan beliefs was they believed that these “demons” or “evil spirits” were sent by the Lord. As for the “name” satan, in Hebrew thought it was an adversary, for instance a foreign king opposing the king of Israel was said to be a satan (1 Kings 11:14) or when Jesus called Peter satan when he opposed Him. It was not referring to “Prince of Darkness” but a flesh and blood human in opposition to God’s purposes. The Persian religion was Zoroastrianism which is the belief that sees the universe as a battleground between two opposing supreme gods – one who was the wise lord and one who was the destructive spirit. Around 70 AD, satan evolved into the Antichrist – God’s antithesis, who is behind all evil, the master of hell. Then English translations of the Bible began capitalizing the S in satan and the D in devil… making it a proper noun… a person, or an entity. Last week we saw that in the New Testament the word devil which is diabolos in the Greek is not a proper noun or even a noun but rather an adjective and means slandering or accusing. NOT “the” Slanderer or “the” Accuser… except 3 different times where it is talking about human behavior and calling the person a false accuser (noun). And we saw that in Eph 6 where our translations say the fiery darts of the “evil one” isn’t a noun either but an adjective describing the darts…. evil darts. But what does the word of God say about spirits? The word spirit all through Genesis referred to either the Spirit of God and life or the spirit of man and the emotions of the soul. Then in Genesis 26:35 we see the word “spirit” translated mind: Which were a grief of mind unto Isaac and to Rebekah. It is in reference to a spirit of jealousy coming upon a husband and he accuses his wife of adultery. If her belly swells up and her thigh rots, then she is guilty of adultery! All of this is presented in v. 11 as And the LORD spoke unto Moses saying! In these ancient pagan religions, the rivers (waters) were thought to have magical powers and adulterous women were thrown into them and if she drowned then she was guilty. Seriously! The LORD said!?! NO! Moses said! Aleph tav’s are prophetic pointers… in Hebrew it is the word et and means signs; it is untranslatable in our English Bibles. In the Gospels a woman caught in adultery is brought and thrown before Jesus – He reveals the Father’s heart toward her – Mercy and Love! That would’ve included training in the magic arts. He also called witchcraft and idolatry a work of the flesh… which this prescription for determining the woman’s guilt or innocence was definitely witchcraft! Go with me to Proverbs 20:27: The spirit of man is the candle of the LORD, searching all the inward parts of the belly. We can see from above that not all that we “hear” is from God… our spirits can become affected by harsh circumstances (like the children of Israel), wrong teachings (as with Moses being taught ALL the wisdom of Egypt), bitterness (like Isaac and Rebekah). Jesus said in Matt 15:19 that out of the heart (the inner man, the mind, will, intention, etc) comes forth evil thoughts, murders, adulteries, sexual immorality, thefts, false testimony and slanders or blasphemies. All communications or “spirits” come from our inner man (spirit and soul) and come forth out of our thinking, our emotions, our self-will, our past experiences, and our future fears. To the Greeks daimon was the same meaning as god. Isaiah 40:18-21 God asks them why they are likening Him or comparing His likeness with an idol made by human hands. He said have you not known? Have you not heard? Has it not been told you from the beginning? And as master of all in my life, I reign from a seated position (like Him) of COMPLETE and FINAL victory. So, we can see that some of our beliefs in modern Christianity about spirit warfare is rooted in pagan religious beliefs of ancient Mesopotamia and Egypt. We say that Jesus defeated the enemy but our need to enforce that victory through constant warfare says that we don’t believe it was a FINISHED defeat. Just how FINISHED IS FINISHED? Ended is mala meaning fulfilled; completed; FINISHED! Col 2:15: And having spoiled principalities and powers, he made a show of them openly, triumphing over them in it. That means stripped of EVERYTHING! Romans 5:17 says that because of the trespass of the one man (Adam – referring to the fall), death reigned (had power). The power of death that came through the fall… sickness, disease, poverty, addiction, fear, etc has no effects in our life; it has been rendered inoperable; it has ceased and been abolished. Paul wrote about it in 2 Cor 11:3: But I fear, lest by any means, as the serpent beguiled Eve through his subtilty, so your minds should be corrupted from the simplicity that is in Christ. And when they embraced that lie… a false perception of themselves… their perception of God changed. They no longer saw God as He truly was, a loving Father who was passionate about them. There are various words in the New Testament to describe this enemy… satan, devil, adversary, thief, etc. And read the Scriptures you believe are about warfare… read those in context and in light of who the writer is talking to, and in light of IT IS FINISHED. He has already fought and won for us AND as us! His victory is YOUR victory! Because His faith, and co-knowing and co-seeing with Him leads us to the place of rest where our testimony is IT IS FINISHED! Revelation 21:5-6: And he that sat upon the throne said, Behold, I make all things new. And he said unto me, Write: for these words are true and faithful. (7) And he said unto me, It is done. I am Alpha and Omega, the beginning and the end. I will give unto him that is athirst of the fountain of the water of life freely. Exodus 14:13: And Moses said unto the people, Fear ye not, stand still, and see the salvation of the LORD, which he will shew to you to day: for the Egyptians whom ye have seen to day, ye shall see them again no more forever. We have the mind of Christ – Amplified says we hold His thoughts, purposes and intents of His heart. Hebrews 2:6-8: What is man, that thou art mindful of him? or the son of man, that thou visitest him? 7Thou madest him a little lower than the angels; thou crownedst him with glory and honour, and didst set him over the works of thy hands: 8Thou hast put all things in subjection under his feet. For in that he put all in subjection under him, he left nothing that is not put under him. But now we see not yet all things put under him. V. 9 – but we see Jesus! 1 Jn 4:17 As He is so are we in this world! We are seated with Him… so why are we still arming ourselves against a defeated enemy?